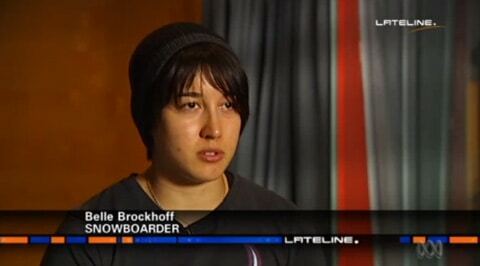 20-year-old Australian snowboarding Olympic hopeful Belle Brockhoff came out of the closet late last week to take a stand for gay and lesbian athletes. "I have a feeling that I would have to kinda go back into the closet a little bit because I don't want to risk my, like, you know, safety, being arrested or deported. I want to be able to compete and live my dream and become an Olympian. That's always what I've wanted to do. … I honestly find it a little bit disrespectul and a little bit sad not only to me but to other athletes and it's my dream, and I want to be able to be who I am, I want to be proud of who I am and be proud of all the work I've done to get into the Olympics and not have to deal with this kind of law." Maybe a little bit of a badge, but, yeah, it's definitely a little bit scary when you think about, like, arrest and deportation, pulling out of events and all that stuff.